It’s easy to write about Macklemore. A straight, white, earnest, indie hip hop artist dominating the pop charts, performing on SNL, and being touted as the “next big thing” while rapping about thrift shopping and LGBTQ rights—as a cultural commentator, you couldn’t ask for much more to analyze. 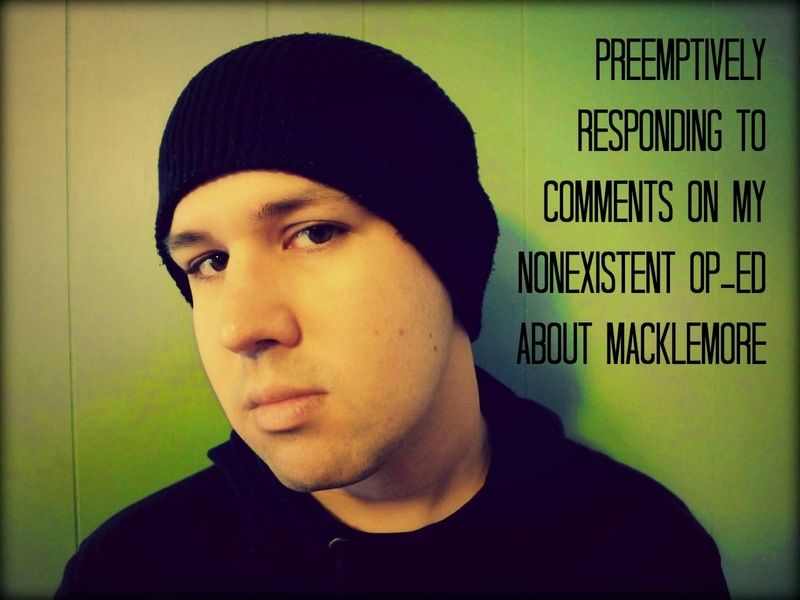 And much has been written about Macklemore lately, from Hel Gebreamlak at Racialicious calling out his multiple privileges, to Rich Juzwiak at Gawker calling Hel Gebreamlak the “self-appointed privilege police,” to a wide range of commentary, sometimes fawning, sometimes scathing, sometimes thoughtful, sometimes bizarre. As a change of pace, I’ve decided to not even write anything about Macklemore and just get right down to responding to the comments that would exist had I decided to write about him. The internet is nothing if not predictable, after all. Nope. Privilege matters. And when we talk about privilege, that doesn’t mean that Macklemore isn’t talented, or that he didn’t work hard. It’s not as though everyone who benefits from privilege (whether race, gender, sexual orientation, class, ability or any other form) just automatically has a perfect life. Having privilege just means that you get certain advantages; in indie hip hop, maybe that’s an easier connection with the majority-white CD-buying public, or more of a willingness for white college radio DJs to play your songs because they relate to your story, or having an easier time booking shows at certain venues because promoters are wary of the stereotypes tied to black rap acts. Whatever it looks like, denying that Macklemore’s indie success is tied to his whiteness, male-ness and straight-ness is just naïve. We can’t move the conversation around oppression forward in this country until we acknowledge that privilege exists and that it matters. Hell, Macklemore himself acknowledges it. At this point, arguing about whether white people should or shouldn’t be rapping is a purely intellectual exercise. White people rap, and a better question might be “what is the responsibility of people of privilege existing in a culture that does not belong to them?” Let’s talk about what real ally-ship looks like. Let’s hold privileged artists accountable when it comes to respecting the history of the culture and giving back to their communities. Even better, let’s use this example as a way to examine how privilege functions in all of our lives. Getting caught up in what one celebrity is or isn’t doing can distance oneself from the issue. Finally, let’s continue to support and promote artists of color, particularly in scenes like the Twin Cities where white kids rapping is less of a novelty and more the norm. Look. I’m not a huge fan. I respect “Same Love,” and I’ve liked some of his work in the past, but in general, I don’t like his voice. I don’t like the way he moves on stage. But I’m also an MC. And when I hear people say that Macklemore isn’t a talented songwriter, or a capable bar-for-bar MC, I have to shake my head a little. Sure, he’s not Kendrick Lamar, but he’s got his own style and he’s paid his dues. I know a lot of hip hop heads who don’t care for his music, but I don’t know if any one of them would say that he’s not good at what he does. I only mention all of this because I’ve seen too much critical commentary regarding Macklemore that’s not coming from a place of authentic cultural knowledge. Academics who read Jeff Chang’s “Can’t Stop Won’t Stop” once, social justice activists who haven’t listened to rap since “Blackstar,” hipsters acutely aware that earnest white rappers aren’t en vogue right now—this motley alliance of voices is very good at analyzing how privilege has played into Macklemore’s success (which is indeed an important topic to discuss). They’re not so good, however, at placing Macklemore’s success—privilege and all—into context, into hip hop as a lived reality as opposed to a sociology paper. This one makes sense. Indeed, a common question regarding Macklemore: “is it fair that a straight artist is getting so much attention for speaking out on LGBTQ issues when artists who identify as LGTBQ are ignored?” Well, no. Of course it’s not fair. But rather than calling for Macklemore’s hip hop letter of resignation, or attacking an artist for speaking out on an issue that he clearly cares about, I think a better question might be “how can we support LGBTQ artists, particularly LGBTQ artists of color?” Let’s buy their music, first of all. Let’s go to their shows. Let’s post links to their work on our blogs and social media platforms. Macklemore is famous because of his privilege, but he’s not famous just because of his privilege; he’s put in work and developed a fan base. If there are other artists out there whom you think are more deserving of praise, help spread the word about them; these days, that’s how artists “get on:” people power. Here are a few of my favorites, all from right here in the Twin Cities: Kaoz, Heidi Barton Stink, Hieu Minh Nguyen and Tish Jones. There are many more. Amen. The only reason I’m writing this is because I think he’s a useful case study to examine the intersections between identity, hip hop, and internet culture that affect us all. But Macklemore can’t be the end of the conversation. Let’s keep challenging our friends, families and ourselves to acknowledge the reality of privilege—and the complexity of hip hop.